This chapter analyzes the transmedia strategies of opposition candidate Alexey Navalny's campaign during the 2013 Moscow mayoral election. 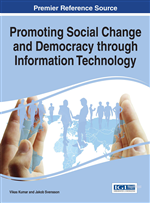 The goal is to highlight how the use of information and communication technology contributed to the development of democratic practices in Russia. His westernized, grassroots political campaign was a novelty in the country, involving online fundraising, door-to-door canvassing, engagement of volunteers, digital projects, and meetings with voters, for instance. The argument is that, although Navalny lost the election, his candidacy represented advancement in terms of both the use of new media and the promotion of democratic development in the midst of autocratic Russia. If the progress will be maintained, it remains to be seen. The theoretical framework includes the reality of the Russian political scenario and the conceptualization of transmedia storytelling strategies in the context of participatory politics. The methodological approach is based on the transmedia analytical model by Gambarato (2013). For a number of years, the mayoral elections in Moscow were deliberately cancelled, and the mayor was directly appointed by the Kremlin (Indina, 2014). However, the 2013 Moscow mayoral election was shaken by the opposition candidate Alexey Navalny and his westernized, grassroots political campaign. Navalny is a lawyer, whistle-blower, and staunch activist fighting against endemic corruption in Russia. In 2010, his anti-corruption blog posts (Navalny, n.d.) and website (RosPil, 2014) became digital phenomena. Since then, he has become a protagonist in Russian politics. His 2013 campaign was replete with innovations in the Russian context, such as online fundraising, door-to-door canvassing, engagement of volunteers, digital projects, and meetings with voters, for instance. Although he lost the election, his candidacy represented advancement in terms of both the use of new media and the promotion of democratic practices in the midst of autocratic Russia. Considering that Navalny almost succeeded in challenging theKremlin candidate, the campaign destroyed the myth that the current government would always win, even in a fair election.The chapter’s goal is to analyze the transmedia strategies of Navalny’s campaign in order to highlight how the use of information and communication technology (ICT) concretely contributed to the democratic development in Russia. The 2013 Moscow mayoral election was the very first social media election in Russia, and its roots can be traced to the 2011–2012 opposition movement. Navalny’s campaign was an extension and consequence of this movement, which involved fundraising for rallies and the creation of Facebook groups aiming at gathering people offline during the opposition protests, among others. In the summer of 2013, Navalny started campaigning using techniques that were new and even unknown in Russia, including ICT solutions such as online fundraising. Online tools were primarily created to pave an easier path for Navalny’s supporters to become volunteers and spread the word about his political proposals, democratizing access to information. As the opposition candidate, he had limited access to mainstream media, especially television; therefore, the online campaign and its consequent expansion into offline activities were the alternative channel to reach the public in a legitimate, democratic manner. In the context of the 2013 Moscow mayoral election, Russian political landscape played a leading role. Thus, this chapter first briefly introduces the Russian electoral system and explains the rise of Navalny. The theoretical framework explores the conceptualization of transmedia storytelling in the context of participatory politics and the methodological approach, based on the transmedia analytical model by Gambarato (2013), is presented and applied to Navalny’s grassroots campaign, demonstrating how it incorporates ICT solutions in a transmedial way. Later the chapter discusses the westernized political campaign and its implications for democratic development in Russia. In conclusion, the findings of the research indicate that: 1) the campaign concretely employed transmedia strategies; and 2) transmedia tools, together with the innovative digital technologies incorporated by Navalny’s campaign, contributed to engage audiences, democratize information, democratize access to capital, and amplify freedom of expression, especially throughout participation. Participatory culture and politics lead to the possibility of individuals to exert their voice and democratically influence on the society.